Have you ever had one of those trips where, throughout the day, many subtle and not so subtle cues told you that you'd picked the wrong destination? You know, like almost getting creamed by an oncoming snowplow or finding a bazillion blow downs in the way? 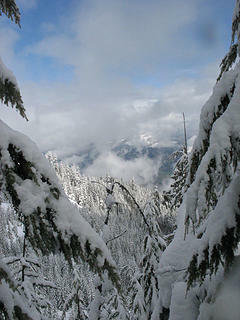 After a lot of last minute waffling about a destination I suggested North Mountain outside Darrington. And the rest of the unsuspecting group agreed! So off we went sunday morning. Heading up past Everett we started to see a dusting of snow on the road, and soon passed a few wrecked cars spun to face oncoming traffic. Still, we pressed on. Driving down Hwy530 was quite slow with the layer of wet, slushy snow reducing speeds. 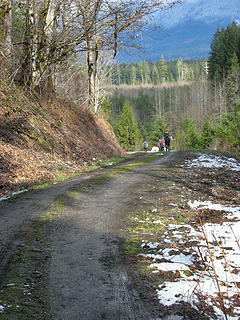 Eventually we arrived in Darrington to regroup and make sure we all found the correct road. First we overshot the turn, but on backtracking we determined it was the correct route. There was an inch so of fresh snow at the start. We started up, my mighty mountain Subaru in the lead. As we went up there were several small water bars to cross and one that looked deeper than the rest. I stopped and hopped out to check it, then on starting up again I slid sideways towards the edge. It was pretty narrow here and while I'm sure I could make it through the idea of possibly backing down through it wasn't appealing. So after an attempt to turn around we ended up backing down the snow covered road to the flat area near the power lines. 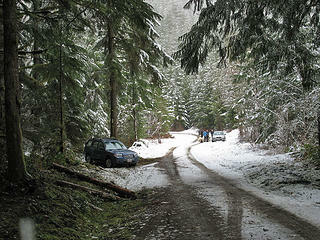 Along the way we had a few tense moments as Joannas Forester nearly went into the ditch. 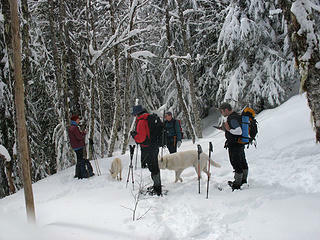 We all made it safely, geared up, and walked up in our own tire tracks. As it turned out we would have been able to drive to nearly 1000 ft, where the road is partially blocked by a small slide and some downed trees. 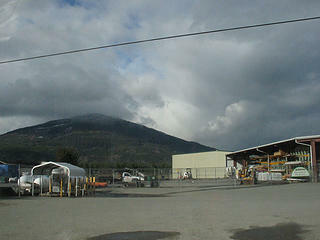 We parked at around 450 ft, lower than the elevation at the gas station where we met. We forged on and soon started to hit blow downs. And more blow downs. And just a few more for good measure. Several we ducked under, some we went over, and a yet a few more we went right through. Just for variety of course. 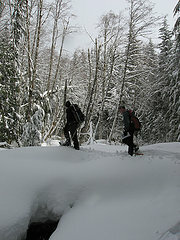 After slogging to 2000 ft we put on our snowshoes as the fresh snow reached nearly knee depth. At least the skies had cleared up though. 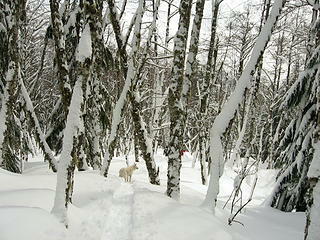 We traded off breaking trail in the fresh, deep snow. The road was undercut by a creek in many places, forcing us to switch back and forth from one side to another. Throw in some more blow downs and this made for very slow going. We'd also been encountering groups of deer as we went, driving Banjo and Holly the dogs wild. Several times they zoomed off, not to be seen for awhile. Higher up we figured we'd passed the deer and the dogs fell in behind Joanna using the broken trail, happy to let us two legged beings break trail for them. Past 2900 ft we stopped for a snack and left the road for the ridge. 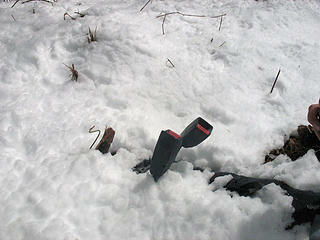 The snow was now very deep and not well consolidated at all. Barry broke trail first, trading off to David as they went. 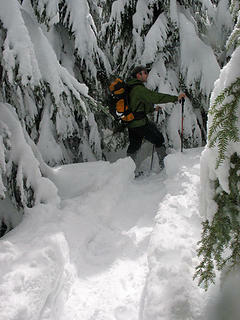 After some steep stretches the route entered some tall, young trees and travel wasn't bad. 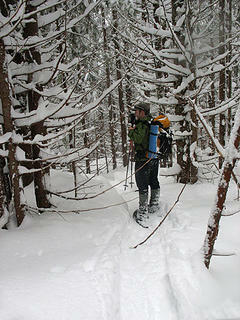 But soon after this we emerged into a wall of dense, short, snow covered trees. We pushed through them, getting showered with snow for our efforts. 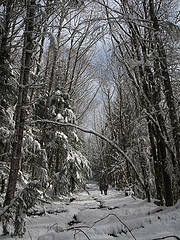 The tree-wells were also partially melted out, creating another hazard. Rather than heading in a particular direction it became a game of "can we fit through there?". Isn't this the end of March? Where did this 3 ft of unconsolidated new snow come from? Not surprisingly all this bobbing and weaving leads to route finding issues. Lacking any views of the summit didn't help either. We went east and found ourselves on a nice little viewpoint, but with not many other options on where to go. We re-entered the trees and fought on for a bit further. At one point I led us directly to a very deep hole in the snow and dead ended the route. Backing up we tried another track, and then another, before a route-finding pow wow. It was now getting late and we'd managed to gain all of 50 ft over a quarter mile in the last half hour. To make things even more confusing our three GPSs all disagreed on exactly where we were! So after some deliberating we decided to head back. But not by backtracking, we decided to make it a loop! 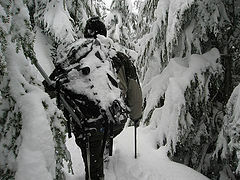 We stepped through some trees ... and in about 20 ft found our ascent tracks, weaving every which way. Since we never made an about-face turn it counts! It may be the shortest loop ever, but we're going to claim that as an accomplishment! 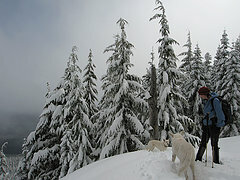 North Mountain loop trip! The descent was much more straight forward. We dropped back to the road and stopped for a food break. I told my GPS to plot our tracks back to the car and it happily told me I was standing on Evergreen mountain, many miles away. Kolleens said she was in Wyoming. I dont know what the heck is housed in that lookout at the top, but it clearly doesn't want to be found! We were on the road at this point though so there weren't many other descent options. 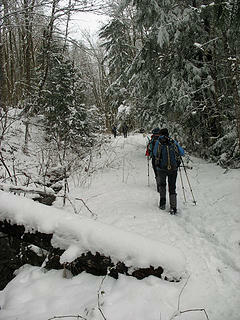 We made good time heading down in the now slushy snow. 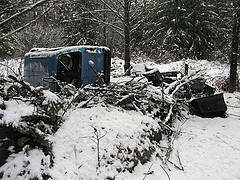 Nearly out of the trees we found the remains of a thoroughly destroyed blue car. Someone remarked it was very much the same color as Joannas sparkling new blue Forester. 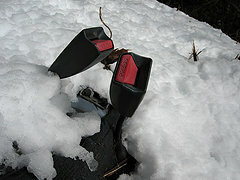 The seat belt receivers poked up through the snow like some alien flower. Soon we were out of the trees and on the now snow-free road down. Happily Whitehorse was out so we at least got to see some snowy peak on this trip. We also found the point where the south road intersects with the west road, which we'd missed on the ascent. Before long we were at the cars, happy to be back down despite missing the summit. At least one bit of news cheered us up: It was still better than Dirty Harry's road. My GPS acted very wonky this trip for some reason. When I got home I had two tracks, one up and one down, and they didn't overlap that much despite descending in our own footprints. And now looking at them, and how close we were to that upper road, I see we were nearly free from our snowy tree prison! The heartbreak of it! The last attempt to drive this road? Seat belt flowers - it's true then, spring has finally arrived! 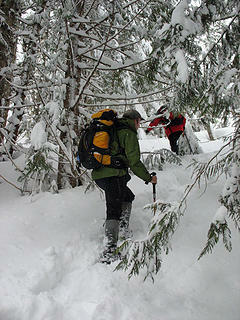 Lots of trip reports today noting "nasty trees" snow bombing wayward hikers. 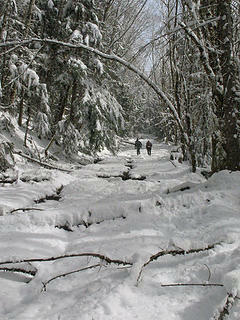 Perhaps the trees are just tired of winter snow and ready for some thawing! It gets weird out there in Darrington. I'm glad you all made it back safely. I bet Quark will have a theory regarding the weirdness around Darrington. That mountain did not want to welcome us today. I think this trip must be related to the 'sundog' we saw last weekend - portending a shift in the cosmic karma. Diry Harry's ghost is obviously entangled as well. For some reason, although I took several pictures, only this one came out...the one farthest from the lookout. Hmmm. I just can't leave you folks to your own devices, can I?! While you were out slogging through the muck, I was absolutely exhausted this morning exercising my retail therapy muscles thoughout San Francisco. The wrist action with the extensor and flexor carpi ulnaris is bulking up nicely from the repetitive credit card action! I had NO trouble finding my way!!! See you next week! s.d. Darrington is one big happy family. Open the Darrington phone book; and check out the last names. White and Brown are the bulk of it. A smattering of Green. It's pretty funny. All colors. 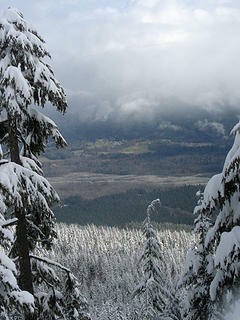 I was up there today as well; probably later than you-all; slush, but no spin-outs and no driving issues. Well, unless you count that busload of nuns. I was immediately forgiven, so it's like it never happened, right? 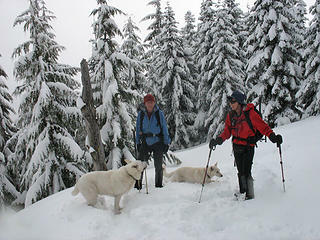 Lots of snow in Oso. I got a mild sunburn on my face too. THanks for the trip report Opus. You rock. Or something. Thanks for the TR; glad y'all returned safely! As my first trip with the group I was a little let down by the initial plan. It seemed pretty tame after reading the exploits of the last month or so. However, as Opus notes it turned out to be plenty challenging. The confusion at the top was frustrating. We had 3 GPS and knew where we were, but it was very hard to blast through the heavily snow covered trees and maintain any heading. This was a good lesson to me as I would have done better with my compass than the GPS to keep a heading. 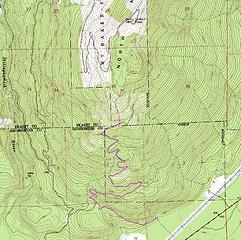 If you look at the end of the GPS track, you can see the nice little unplanned loop that we ended our attempt on. Breaking trail through the trees was hard for the first person, but the five behind were getting cold due to the lack of forward progress. Overall, I did enjoy the trip with a great group of people (and dogs). It was a winter wonderland (even for the end of March). But with all the blow-downs to get around, the prolonged road walk and the Dirty-Harry like stream ditches to get over/along, this trip will not go into my top 10 (or even 100) to repeat in the near future. As above, maybe if the Av danger is extreme, I would try this again. My GPS seemed to function properly (most of the time). For the trip I had 11 miles and about 3000 feet of elevation gain. A good workout. 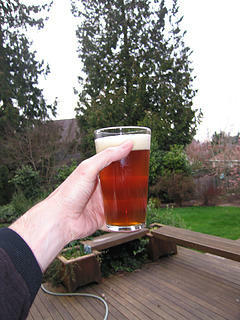 Back home enjoying the latest batch of American Pale Ale. With such poor visibility I didn't get many photos. Here are a couple of my favorites. Suzanne and Bob were out of town so we cobbled together a group of Kolleen, Barry, David, David (Opus), plus Joanna and two of her dogs. 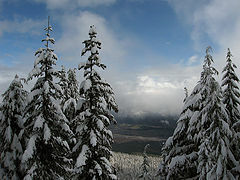 Late in the week we had a little snow in the lowlands and up to a foot and a half in the mountains. 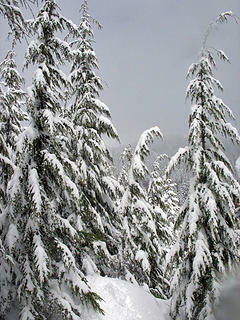 The snow was much heavier near Snoqualmie Pass than farther north. With all that in mind, Opus came up with North Mountain. There were two trip reports earlier in the winter by Justus and Matt. 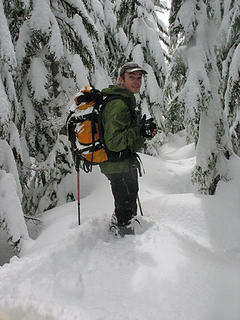 I thought we had duplicated all of Matt's winter lookout hikes the past few weeks but I forgot about this one. 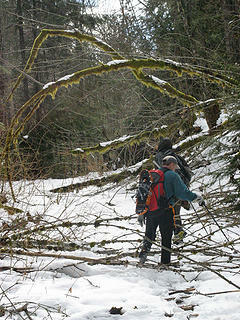 Matt's group found one route to be a mess in a big clear cut so we had some info to go on. We met at the 160th St. Park and Ride near Kirkland and headed north. Near Marysville there was a little slush on the freeway and two cars were pointing the wrong way. A tow truck was busy cleaning up the mess. Was this an omen of what was to come? Well, I think it was. As we went through Arlington a little light snow was falling. Farther east the snow began to build up on the roadway. We were only going 40 mph as the snow was an inch or two deep across the road. 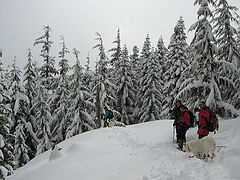 Darrington is at an elevation of only about 500'. I did not expect to have a problem with snow before we left the highway. A snowplow came along in the other direction and crossed the center line. Opus had a good scare here. 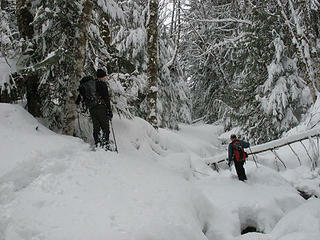 As we neared Darrington the snow began to lessen and the road was now plowed clear. We stopped at the Shell station and waited for Joanna. There was snow all over town but not too deep. Joanna soon arrived and we headed on to the trailhead. There are two roads that can be used. The first one is about .7 miles north of the ranger station. This road goes all the way to the summit of North Mountain in some 14 miles. A little too long for us this day. 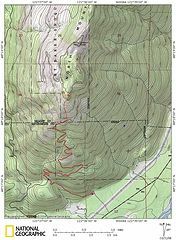 The map also shows an old road that connects the first road with the second one. That one is 1.2 miles north of the ranger station. That is the road Justus took and the one we were aiming for. The road switchbacks up the south ridge of North Mountain going nearly to the top. We passed the first road and missed the second one. It was snow covered. We turned around and Opus spotted it. We drove under the power lines and the road soon began to climb. After a discussion we chose to try driving higher. The road steepened and was narrow. We were concerned about finding room to turn around three vehicles. David stopped at a water bar where the road was very narrow. When he started we slid sideways. Maybe this wasn't such a good idea. 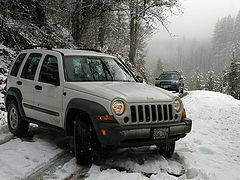 We ended up backing down the snowy road to the flat bottom. We hoped to drive 500'+ up the road. 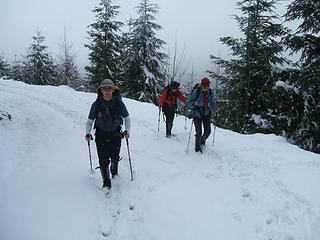 We started at the level of Darrington. After wasting a whole lot of time we were ready to get going. With the slow driving in snow, the wait to get together in Darrington, and our parking travails, our 7:30 meeting time ended up leading to a 9:45 starting time. Was this mountain conspiring to keep us away? At the parking spot we saw a car on it's side. Not a great omen. The road switchbacks up the slope at a fairly gentle grade. 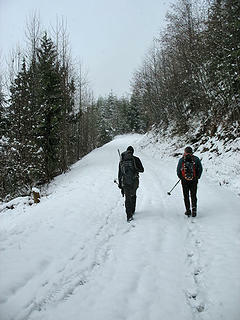 We began at 500' and had no trouble booting up the snowy road. There is one long switchback we hoped to miss by heading right up the slope. 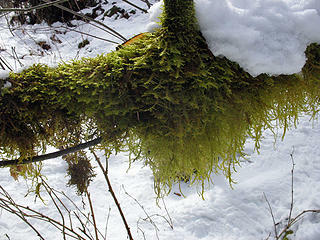 The brush was thick and heavy with lots of new wet snow. We chose not to leave the road. We looked for the connector road from the long road to the summit and could not find it. Even with multiple GPs units. On the way down the snow had melted enough to make finding it easy. After much easy walking we began to find downed trees. Some we could go over, some under, and some around. 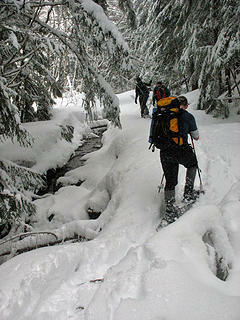 Many were a real pain as kneeling down in 6 inches of fresh wet snow was no fun. Some of us saw three deer then two more later. I was not out front and did not see any of them. The snow continued to get deeper. 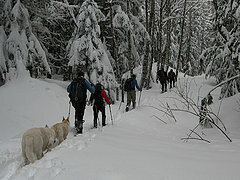 At about 2000' we stopped to put on snowshoes. The road is so gentle that it took a lot of miles to gain much elevation. We knew it had to get steeper at some point. The snow was completely unconsolidated. This trip would have been much different just a few days earlier. 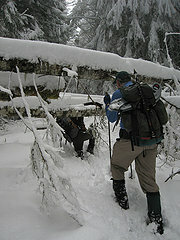 We had more downed trees to navigate as well. Finally, at about 2900' we prepared to leave the road. After some food and water we headed up. In the trees the snow was merely deep. In open spaces it was really deep. Barry and David did most of the trailbreaking. 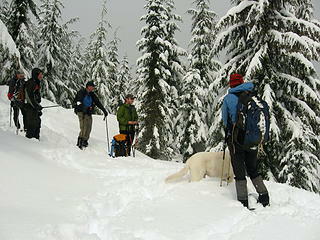 The grade was not all that steep but with the deep soft snow it made for slow going. Higher up it was now obvious we were on the ridge top. 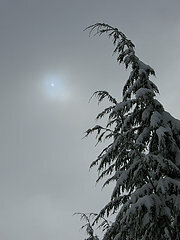 It was completely forested and the clouds allowed for no views at all. We worked our way along the ridge as the grade dropped to nearly flat. Now the real fun began. The forest of well spaced trees gave way to smaller trees packed tight together. We had to push our way through small gaps. 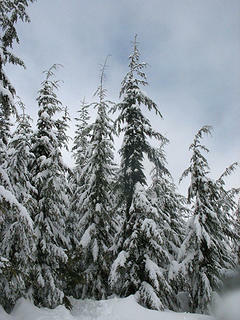 The trees were completely flocked with wet snow soaking us as we passed. Our pace dropped to next to nothing. Falling into tree wells or voids was a real concern. Opus was out front when he could find no way to push ahead. We turned to the right and found a small clearing. From here we tried to get back to the crest. There was one hole that was at least 10 feet deep. I could see dirt at the bottom. Falling into that hole would really be dangerous. We tried maps and GPSs and had a hard time figuring exactly where to go. The leader worked real hard but everyone else stood around and froze. We calculated that we were .50 miles and 400' from the summit. So close but yet so far. With the difficulty of the wall of trees we might still be an hour from the top. We made the painful decision to head back. We also found that our meandering route through the trees brought us back to where we originally found a dead end. It was the shortest loop trip I have ever done. We were only a few feet from the clearing so we went back and had our only views of the trip up. Not great but we could see a little of the valley below and in the vicinity of the summit though it was still mostly in clouds. It took us 4:20 to cover about 5+ miles. It was now just after 2:00 PM. Our trench was deep and well packed. We flew back down to the road. We were back there in no time. After finishing lunch we headed down the road. The mountain ate us up and spit us out but it was not yet done. The GPSs showed some strange readings at this point. Opus's thought we were on Dirty Harry's Road near Snoqualmie Pass. David's was just off a little. Kolleen's took the cake as it showed us in Wyoming. Just what is really up in that lookout? It sure messed up our electronics. The trip down was mostly uneventful. 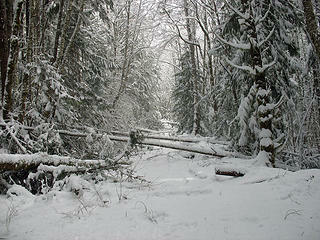 The downed trees were still a pain but seemed less onerous than on the way up. Lower down there was a lot of snow melt. The last mile of so was bare road. It was overcast most of the day and it even snowed some. I was surprised to see so much melting. 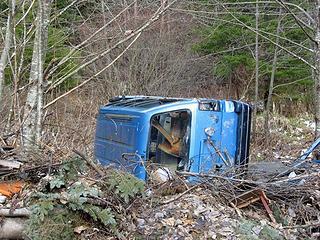 We found another car in many parts below the road. We even passed a stove. After about half the time it took to ascend we reached the cars. This was an interesting trip. 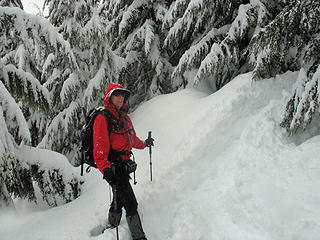 It had very low avalanche danger on a day with much new snow in the mountains. The route finding was pretty straight forward. The amount of new snow was very surprising. I think we made the most of a marginal day. It was a fun group. I enjoyed hiking with David for the first time. 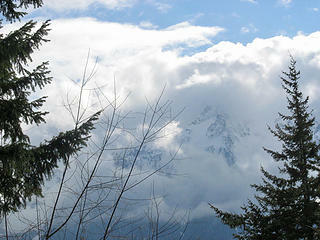 As we sped through Darrington we were able to look north and see North Mountain for the first and only time this day. 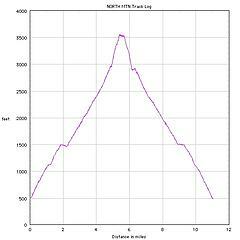 Statistics for the day were about 10+ miles with 3000' of elevation gain. I have added 25 photos to my report just above this post. Eric said the route to the true summit was nasty even without the snow (think brush) Of course, Eric can tell the story best. Eric? What a crazy trip! Obviously there's more to mountains than summits...sounds like y'all had a great time. So what's with all the GPS discrepancies? I don't own one yet but that does not exactly instill my confidence in their usefulness... Or was it just a Darrington thing?